Ecumenical Youth Council in Europe → EYCE News → Campaign to Promote Ecological Justice → Sustainability journey: 4 cities in 4 days! Sustainability journey: 4 cities in 4 days! From the 4th – 8th of October 2013, the Campaign Coordination Team (CCT) of EYCE’s Campaign to Promote Ecological Justice has visited the three Baltic countries -Latvia, Lithuania and Estonia -, and then Finland during its project “Sustainability journey: 4 cities in 4 days!”. Members of the CCT were stopping in Riga, Vilnius, Tartu and Helsinki, to meet local youth, raise awareness on environmental issues and spread the message of the EYCE’s Campaign to Promote Ecological Justice. In Riga, the activity and discussions focused on analysing the particular context in Latvia regarding environmental and sustainable issues, as well as on possibilities for bringing a change. The main conclusion made was that the key for changing our personal habits is education. 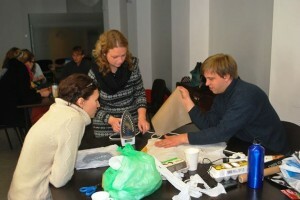 In Vilnius, four practical workshops took place: two dedicated to upcycling – creating wallets from juice boxes and lamps from plastic bags , and other two experimenting with raw food for a healthy and nutritious breakfast, and making eco-friendly detergents from simple and harmless ingredients. The workshops induced great discussions about our consumer habits and how can we change them in a greener way. In Tartu, discussions were focusing on environmental and sustainable habits, such as recycling and the preservation of nature. The lack of recycling infrastructures in some areas were pointed out, but also examples of a good initiatives were given: the “Let’s do it!” project in Estonia. It is an international project organising clean-ups in forests, parks and other places shared by the whole society. In Helsinki, a text study on international environmental policies and on the so-called Conference of Parties (COP) was used as a basis of debate and put in relation with the specific context in Finland. Then an interactive Bible study took place, where the participants had to listen to a Bible verse from Genesis, describing the flood, with their eyes closed and then in small groups play a scene, interpreting the verse and portraying different characters described there. Results were very different from one group to another! Discussions pointed out the responsibility of decision making structures to make green choice easier and more affordable. To conclude, debates and discussions were passionate and highlighted the lack of infrastructure in some places to help people to be more involved in environmental issues (recycling practicalities, affordable green materials, more eco-friendly alternatives…). It could be solved by a better political involvement and education on environmental issues. However, most of the time we can directly, through our personal habits, act and raise awareness around us by being a good practical example, by being an eco-hero! !